Happy Birthday Author: Birthday Book Bonanza! Every week in the month of March 2010 you will have a chance to win a book written by an author we have celebrated here at Happy Birthday Author. To be eligible to win you will have to add a comment to this blog post saying that you would like to be entered. Make sure you identify yourself by using your account name or leave your email address. I will then get in touch with you via email to get your contact information to mail your prize. 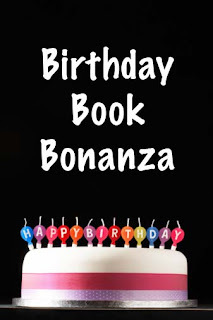 You can also earn an extra entry into the Birthday Book Bonanza by sharing this website to a friend, teacher, or librarian. Referrals could be through Facebook, email, or just through word of mouth. We will have to do this on an honor system, so just mention in your comment that you shared the website and I will give you an extra entry. This contest is for US residents only. I will announce the winners each week on Monday, therefore March 8, 15, 22, and 29. Just post "I want to be entered" here to be eligible to win, Book 1 of the Captain Underpants Series by Dav Pilkey, birthday March 4. Don't forget to refer, Happy Birthday Author, to a find to receive an additional entry. Drawing will be Monday, March 8. I told teachers at school about this website. I want to be entered! Thank you for the giveaway. I would love to be entered. Thank you. I want to be entered to win one of these great kids books. I would love to win a copy of Captain Underpants. My 2 oldes t kids love those books. I am a new follower from Book Blog. I am blogging about your contest on my blog! This week's winner was Barb. Congrats!